The proof is in the operation . 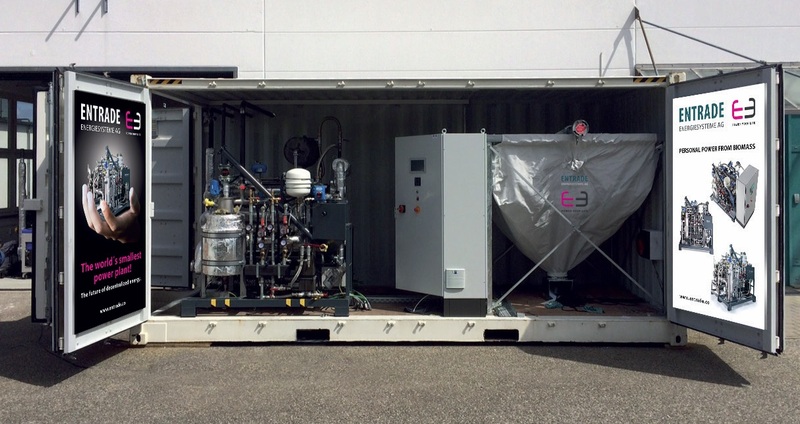 . . . .
At the end of May this year, TW Power installed the first Entrade E3 Biomass CHP system in the UK. We set out to run the system as proof a unit can run without needing constant attention. Three months later we have run the system for over 2,200 hours and exported over 35,000kWh of electricity and ran our warehouse facility with no requirement for grid electric or heat. The system has run with minimal downtime with most downtime due to us running out of fuel. With Entrade remotely monitoring the system 24/7, we can run our day to day business activities knowing the system is looked after and planned maintenance can be easily co-ordinated. If we are looking to achieve an operational time of 7500 hours per year, this means that you have to be fully operational for at least 20 1/2 hours per day. By having remote management on the system, you can go to bed at night knowing it's operational. TW Power have also successfully had their E3 RHI and ROC accredited, the first in the uk, making fantastic returns on investment. With the wind and solar industry having a major blow in tariff cuts and biomass being hit with digression after digression, small scale Biomass CHP becomes the best technology for investment. TW Power can supply all the necessary equipment to convert the E3 for RHI and ROC applications as well as all the paperwork required to accredit the E3 system quickly and efficiently. As we have seen with other technologies, these tariffs do not last long so contact us now and benefit from 20 years of payments. What becomes crucial with this technology is the uptime of the equipment. There are some great systems coming out on the market but most require very dry wood chip with less than 10% moisture content. It is almost impossible to have wood chip delivered at this level and stored without it soaking back in the lovely British atmosphere and causing downtime on your equipment dramatically effecting your revenue. An on-site chip drying system is almost certainly required. This can work very successfully, however, all this takes time to manage. If you have nothing to do in the day or have on-site maintenance staff capable of spending time managing the chip then a chip system will work but its far safer in your cost models to assume 6000 run hours a year. However, if you’re a business wanting to simply gain independence for your energy use and have a great return on investment, pellet is your answer. A standard, low moisture content fuel that’s easily delivered, stored and transported. I have a lot of people mention how chip is far cheaper as a fuel. The price per tonne is certainly cheaper but when you take into account the cost for storage, drying required, man power for moving the fuel in and out of drying bays, the downtime on the system due to wet chip, blocked augers due to large pieces and also when you buy wood chip, you are usually buying a fuel that 20% of it may be water, pellets suddenly start looking a great deal better . . . . . If you want to see the unit operational, contact me at info@twpower.co.uk and we can arrange a site visit for you.